Raumfahrt+Astronomie-Blog von CENAP - Blog: Astronomie - Entangled particles might reveal the interior of black holes A new quantum approach arises to the question of whether information can escape black holes. 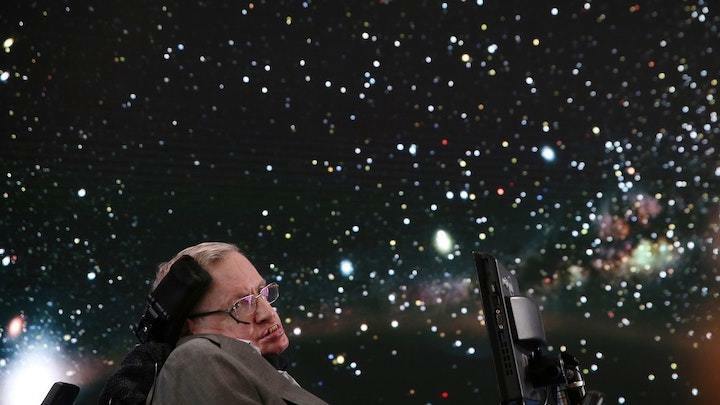 The late Stephen Hawking first identified a potential security breach in the theory describing black holes. Scientists may have figured out the way to see into a black hole. The key? Teleporting the information out of the abyss into a quantum computer. Black holes have the reputation for being places of no return. Their density is so large that for anything to escape the gravitational pull it would need to travel faster than the speed of light, an impossibility, according to Einstein’s Theory of Relativity. But quantum physics says that information is not lost, notes Kevin Landsman, a PhD student at the University of Maryland, US. Landsman is the lead author on a paper in the journal Nature, which examines the teleportation and unscrambling of quantum information. There could be a way to extract information from black holes, after all, he and his colleagues found, via the quantum entanglement. The concept is not new. In 1974 Stephen Hawking pointed out a possible breach in black hole security, thanks to the way that quantum particles pop in and out of existence. This constant interchange between energy (radiation) and mass (particles) always occurs in pairs with opposite qualities, to balance the universe’s books for quantities such as energy, momentum and spin. The unidentical twin particles are said to be entangled. One of quantum physics’ greatest mysteries is that the particles’ quantities are not defined until one is measured in some way, or interacts with something. So when linked pairs are created both particles remain undefined until one of them interacts, causing it to immediately take on a set of values. And its twin – wherever it’s travelled to – will also instantly take on opposite values to balance things out. The mysterious ability of the twins to instantly know what’s become of each other is known as quantum teleportation. The link between the two can even give information about a number of interactions, beyond the first one that defined the entangled pair’s qualities. This is known as an out-of-time-ordered correlation function. If one of a newly-created pair falls into a black hole then the surviving twin’s entanglement link to it creates a kind of intercom into the otherwise impenetrable black hole. And it’s this link that Landsman and his colleagues decided to explore. Even though the particle inside the black hole interacts with other particles, which scrambles its information, the team believes unscrambling it is possible by doing a “massive quantum calculation” to analyse the escaping twin. “This is expected to be really, really hard, but if quantum mechanics is to be believed, it should, in principle, be possible,” says co-author Norman Yao, from the University of California Berkeley, US. To simulate the black hole the team used a quantum computer with seven quantum particles (known as qubits) in the form of very cold ytterbium ions suspended in electric fields. Four of the qubits were paired up: first entangled and then separated. This is analogous to dropping two into a black hole, while their twins remained outside, but linked. A third qubit was added to the two inside the “black hole” as an input to the system and the three allowed to interact, scrambling up their quantum information. The two outside were allowed to interact with a third qubit as well, and a fourth was then allowed to interact with all three. As hoped, the researchers found that the information was shared among the particles inside the simulated black hole and then teleported to the outside group. The information transfer was not perfect, however. The researchers claim a teleportation fidelity of approximately 80%, meaning that imperfections and noise claimed about half of the quantum information while the rest was shared between the qubits. The team see the experiment as a successful first step: retrieving lost information is impossible, but unscrambling it is not – even if, like unscrambling an egg, it is “really really hard”. While the quantum computing achievements are remarkable, whether they can be used as information portal into black holes is far from settled, says Geraint Lewis, a cosmologist at University of Sydney in Australia. “Black holes are mysterious places, where our theories of gravity and quantum mechanics refuse to play nicely together, leading to a lot of speculation on how information leaks out,” he explains. Notwithstanding expeditions to black holes, Yao says the team expect there will be much more practical applications for their teleportation and unscrambling system.